1569002738 -In today’s health care environment, occupational therapy practitioners in clinical and leadership positions must be prepared to ensure that clients receive the highest quality of care; personnel morale and efficiency remain high; businesses and organizations are profitable; and the occupational therapy profession is recognized by other health care professionals, reimbursers, and clients as a valuable service steeped in evidence. This book can help occupational therapy practitioners become capable, effective leaders across all practice settings. This edition includes 37 new and updated chapters, discussing the how-to aspects of creating evidence-based practices; effectively leading and motivating staff; ensuring ethical service delivery; and important day-do-day items such as budgeting, documentation, and reimbursement. Chapters also are updated to reflect health care reform and its potential effects on occupational therapy. 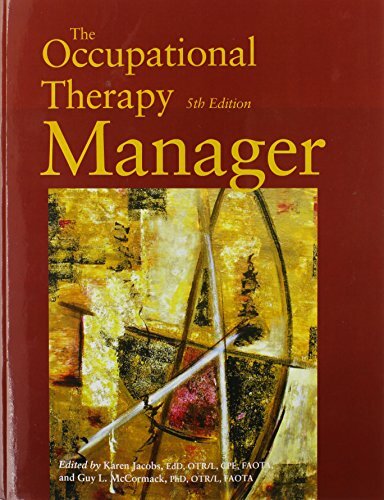 The Occupational Therapy Manager is the best-selling and most comprehensive management book in the profession and is a fundamental, classic text for occupational therapy students, practitioners, and managers.